I had a great Thanksgiving in Bluemont, Va. My friends Wes and Erin have a great family. I ate at the Underwood's house; they operate the beautiful, hilltop Rockwood Ridge Farm. The man of the house, Lester Underwood tends to the farm's sheep and cattle everyday. One of the penned ewes stomped her foot at me when I got too close to her lambs. "They won't hurt you," Lester assured me. I hopped in the truck after Blaze, one of the farm's herding dogs. 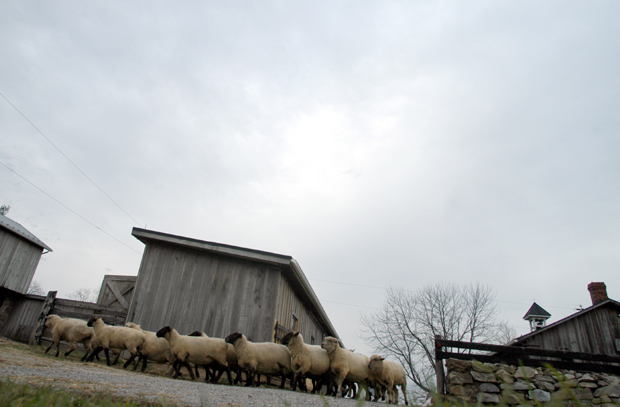 When we got to the pasture we made a wide circle around the flock and drove them to the barn. The dog rides in the backseat of the truck and, of course, the sheep have to walk.